Knaus sells more motorhomes in Germany than any other brand. What’s more, having made great strides following a change of ownership in 2009, the marque has a comprehensive offering across the board, from panel van conversions to A-classes. A selection of Knaus models is imported to the UK via Lowdham Leisureworld, based in Nottingham and Huddersfield, and Southdowns Motorhome Centre, in Portsmouth. 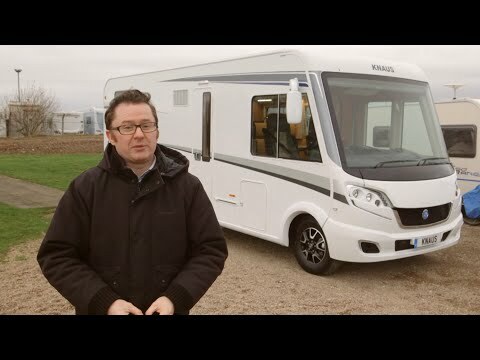 These models boast an improved specification for the British market, including a range of base vehicle and motorhome option packs, and gas ovens. Knaus topped our Practical Motorhome Owner Satisfaction Awards 2014 for pre-owned vans, polling an almost perfect 98.9%; so potential buyers need have no worries about the quality of design or build. The Sky i range of A-class motorhomes sits close to the top of the Knaus portfolio. With its panoramic windscreen, brilliant white sidewalls and attractive front panel, this is a good-looking vehicle. In 700 LEG configuration, the Sky i features on-trend fixed twin single beds at the rear, over a large garage; a manually operated drop-down bed above the lounge provides two extra berths. A washroom is split across the width of the ’van, and there’s a continental-style L-shaped kitchen on the UK nearside. With mid-toned cabinetwork and dark, granite-effect worktops, the 700 LEG has an upmarket feel that befits a motorhome in this price bracket. The Sky i 700 LEG is based on the Fiat Ducato with a 2.3-litre engine producing 130bhp (our test ’van had the 150bhp engine upgrade). The driving position is commanding, with excellent visibility from the tall windscreen. A pair of coach-style side mirrors offer good rearwards vision, but a reversing camera – as fitted to our test unit – would surely be a must on a vehicle this long and expensive. Another external feature of note is the Unique Service Box, a hatch on the nearside that groups the water intake, mains hook-up connector, leisure battery and water tank drain taps in one place. Three people can be accommodated by the L-shaped seating group in the spacious lounge, with the rotated cab seats and offside single sofa allowing three more occupants to join the party. Our test ’van had leather-covered seating finished in the ‘Las Vegas’ cream and chocolate combination; the seats were comfortable with plenty of support. A retractable TV lives in the space behind the offside sofa, next to the habitation door. Knaus has served up a well-equipped galley that fits in snugly between the front dinette and shower cubicle. A 155-litre fridge with separate 35-litre freezer compartment is located on the opposite side, under a gas oven and grill. With rear twin single beds that can be converted into a double by adding an infill cushion, as well as a spacious drop-down double bed over the lounge, the 700 LEG will cater well for couples touring with occasional overnight guests. The rear twin beds measure 2m x 0.86m (6'7" x 2'10") and 1.95m x 0.86m (6'5" x 2'10") respectively. The drop-down bed measures 2.12m x 1.23m (6'11" x 4'). Cold-foam mattresses and Froli springs are used throughout. The split washroom – a circular shower cubicle on the nearside and a toilet compartment on the offside – can be used in privacy by occupants at both ends of the motorhome. The offside toilet compartment’s door will also create two discrete spaces: open it fully and it locks shut to form a wall between the kitchen and bedroom. A partition then pulls across from the foot of the offside rear single bed to separate the washroom from the bedroom. Plenty of storage is available in the Sky i 700 LEG, the largest space being the rear garage that can be accessed from both sides. Six overhead lockers feature throughout the ’van, plus there’s a half-length wardrobe under the nearside rear bed and two cupboards in the washroom. Kitchen storage is excellent, with pull-out wire racks and three drawers. A cupboard for stowing shoes is located under the offside sofa. Standard equipment in the Sky i range includes Aguti swivelling cab seats, flatscreen TV and Truma Combi space- and water-heating. The UK specification adds Fiat’s chassis and media packs, Sky i pack, TV pack, styling pack, décor pack, cab blinds, wooden shower grate and drop-in carpets. There’s a lot of choice when shopping for an A-class at this price point. The 2015 Sky i 700 LEG is a refined ’van with a good specification and masses of storage, plus some genuine innovation.